Publisher: W. Foulsham & Co., Ltd. Country: United Kingdom. Date: c. 1928 - c. 1952. 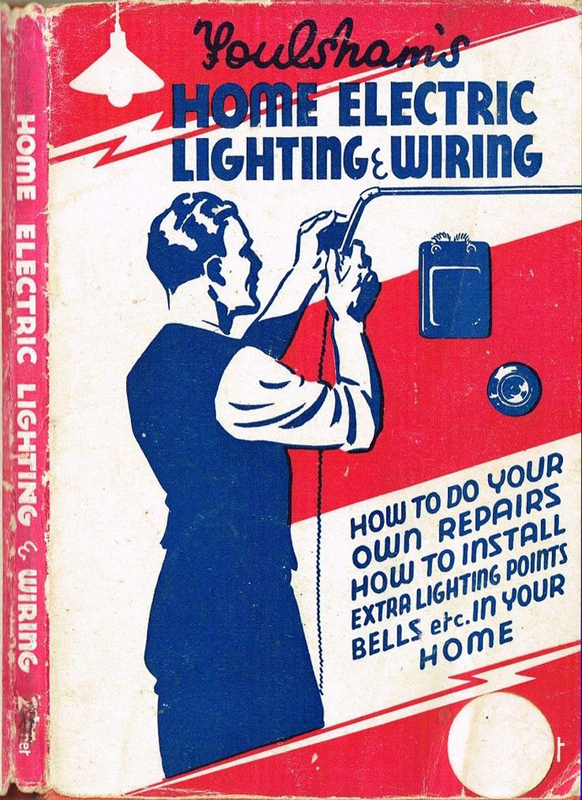 Home Electric Lighting & Wiring: How to Do your Own Repairs. How to Install Extra Light Points, Bells etc in Your Home by Edward Hobbs. London, W. Foulsham & Co., Ltd., 1935 (Foulsham's Practical Manuals). NOTE: The listing seen here is for another of the Foulsham's book series, the Foulsham's Pocket Library (not for the Foulsham's Practical Manuals). Series Note: For a biography and bibliography on the Edward Walter Hobbs who wrote several volumes in this series, see the Brighton Toy Museum website page here. Foulsham's Practical Manuals, No. 5. Foulsham's Home Leatherwork. Fifty Practical Designs and Methods, etc. Mary Graham, writer on domestic crafts. Foulsham's Practical Manuals, No. 7. Home Electric Lighting and Wiring, etc. Foulsham's Practical Manuals, No. 4. Foulsham's Practical Manuals, No. 3. Foulsham's Practical Manuals, No. 2. 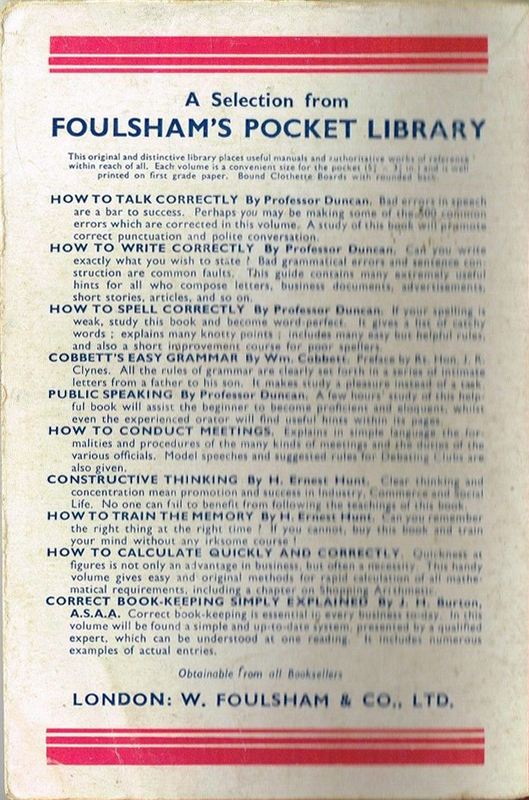 Prewar newspaper display advertisement for Foulsham's Practical Manuals. 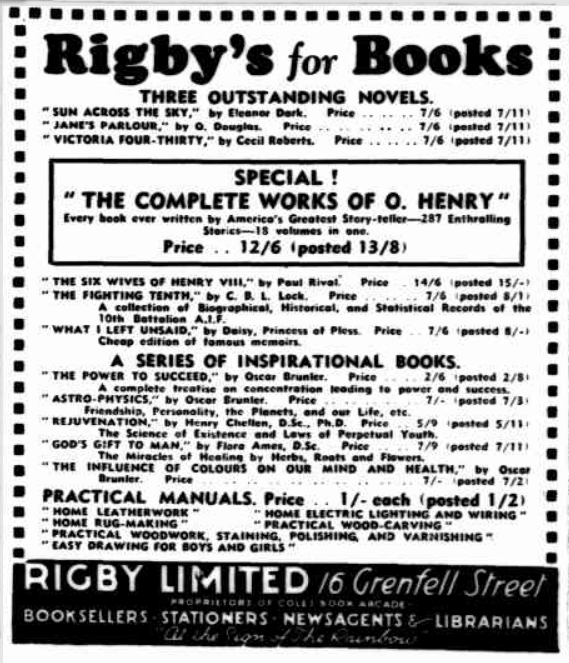 This ad was placed by the Rigby Limited ("Booksellers, Stationers, Newsagents, Librarians, Proprietors of the Coles Book Arcade"), of 16 Grenfell Street, Adelaide, South Australia. "At the Sign of the Rainbow". Rigby Ltd. were to become an important Australian publisher in the 1960s and 1970s. Source: The Advertiser, Adelaide, 4 September 1937, p. 12.